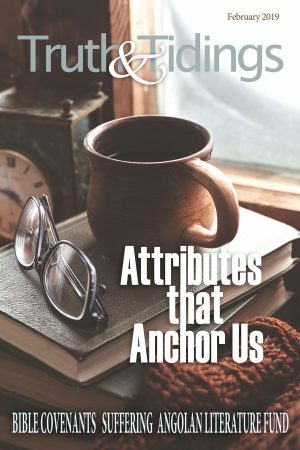 Part of the Attributes that Anchor Us ~ Various series. Hear, O Israel: The LORD our God is one LORD.” With these emphatic, uncompromising words begins the Shema – the Hebrew confession of faith and the preface to the commandments which the Lord delivered to His people as they stood on the threshold of the Promised Land (Deu 6:4). It was intended to be the bedrock of their beliefs and their constant companion at home or abroad. By constant reiteration of this truth, the Lord intended to ensure the integrity of His people’s affections for Himself, ultimately guaranteeing the prosperity of all their affairs – domestic and international. The force and timing of this confession are hugely significant. First, although the wilderness proved to be a physically austere place (which they survived only through the miraculous provision of food and water by the Lord) for the new-born nation of Israel, it was a relatively benign spiritual environment. Just as the pillar of fire and cloud protected them from natural elements, so the solitude of their wilderness encampment and the special presence of the Lord had largely separated them from the darkness of Egypt and shielded them from the withering blaze of Canaanite religious pluralism into which they were about to enter. Second, even having experienced His mighty deliverance from Egyptian tyranny, the previous generation had turned back in fear at Kadesh-Barnea (Deu 9:23). Faced by the spies’ reports of impenetrable strongholds and formidable foes, they had doubted the Lord’s present ability to give them the victory. Their faithless fathers had recklessly wished for, and been granted, death in the desert (Num 14:2), but now the children must face the foe. This introduces us to the first sense in which we say that God is one – numerically. There are not many Gods. Though He is known by many blessed Names, there is only one true God. This statement affirms the Uniqueness of God. He is alone – without equal: “I am the LORD, and there is no other, besides me there is no God” (Isa 45:5 ESV). And, He tolerates no rivals: “You shall have no other gods before me” (Exo 20:3 ESV). In an increasingly pluralistic and hostile world, solid convictions about the singularity of the true God will both anchor our affections and embolden our endeavour. His uniqueness demands that no competitor come before the Lord in our hearts, and the assured knowledge that there is no god besides the Lord gives strength and courage, even in adversity. “Therefore, my beloved brethren, be ye stedfast, unmoveable, always abounding in the work of the Lord, forasmuch as ye know that your labour is not in vain in the Lord” (1Cor 15:58 KJV). In the NT, the importance of the Shema was emphatically reinforced by the Lord Jesus, for when the Pharisees came to test Him, asking which was the greatest commandment, the Lord replied by citing the words which immediately follow it in Deuteronomy 6: “Thou shalt love the Lord thy God with all thy heart, and with all thy soul, and with all thy mind. This is the first and great commandment” (Mat 22:37-38, emphasis added, KJV). Moreover, He did not stop there, continuing to say, “And the second is like unto it, Thou shalt love thy neighbour as thyself. On these two commandments hang all the law and the prophets” (Mat 22:39-40 KJV). This expert handling of the Law masterfully introduces the second sense in which we speak about the oneness of God. The Lord Jesus showed that the statement that God is one must also be understood qualitatively. That is, it affirms the absolute Indivisibility of God and describes the perfect, harmonious consistency of all His person and works. By inference, to claim love for God, as the Shema demanded, while harbouring hard thoughts about my neighbour is contrary to the unity of the Law. Highlighting that this is not only the “great” commandment but the “first” of a consistent series – part of a whole – the Lord affirmed that the Law is one because the Lawgiver is One. This perfect consistency is all the more wonderful when we consider the biblical revelation that God is three distinct personalities existing as one harmonious Whole. That three are One in eternal essence, importance, will and purpose, yet absolutely distinct in person and function is clearly implied, often affirmed, but never explained in Scripture. It is truth to be received by faith, to be enjoyed and to build upon. Indeed, we must beware all attempts to explain or illustrate the mystery of the Holy Trinity – Father, Son and Holy Spirit – as all are inevitably inadequate and often lead to error. For example, at one end of the spectrum of error are those, such as “Oneness Pentecostals” and others, monotheists who embrace variations of the ancient heresy of “Sabellianism” – that God is one person who only appears in different forms. Beware the “ice-water-vapour” analogy! At the other end of the spectrum are those who believe in three (or in the case of Mormons, more) separate Gods. Beware the egg “shell-albumen-yolk” analogy! Indeed, not accepting the doctrine of the Trinity, Muslims accuse Christians of being tri-theists – believing in three gods, not one. Somewhere in between are modern-day Arian equivalents, such as so-called “Jehovah’s Witnesses,” who teach the heresy that Christ is a lesser created deity. However, as the Lord Jesus affirmed, the truth of the oneness of God is not only inexhaustibly profound but intensely practical. As the three persons of the Godhead are entirely one in holy will and purpose, so are we to be one with them. Just as the Godhead does not exist in fragmented parts, so there is no room for hypocritical, compartmentalised inconsistency in the life of a believer. Indeed, our relationships with each other must be characterised by the lowly, loving mind of Christ if our profession of love for God is to be more than the hollow ring of hypocrisy. Finally, on the eve of His crucifixion, He prayed for His disciples “… that they all may be one; as thou, Father, art in me, and I in thee, that they also may be one in us: that the world may believe that thou hast sent me … that they may be made perfect in one; and that the world may know that thou hast sent me, and hast loved them, as thou hast loved me” (Joh 17:21-23 KJV). In reality, the mutual love of the body of Christ is incontrovertible proof of our unity with Christ and His claim to be one with the Father who sent Him.